You can’t think of Alaska without thinking of fishing. Sport fishing contributes millions of dollars to our economy and is an iconic part of the Alaskan lifestyle. What’s stopping you from getting out there? We offer workshops and classes where you can learn new skills or sharpen old ones. We'll set you up with equipment you can borrow for free. If fishing is already your passion, you can help us ensure the tradition continues as one of our angling ambassadors. Hands-on workshops that teach adult women outdoor skills while building their confidence in their ability to get out and safely enjoy all that Alaska has to offer. 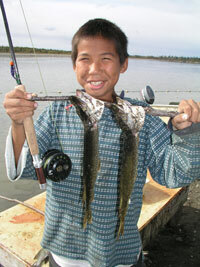 Fishing is easily accessible around most of Alaska and fishing equipment is too thanks to our rod loaner program. Find out how you can borrow equipment for free. Taking care of one of Alaska's great resources - some recommendations on being an ethical angler. Regulations, bait, strong line vs. pole set methods, hook size, and where to fish.